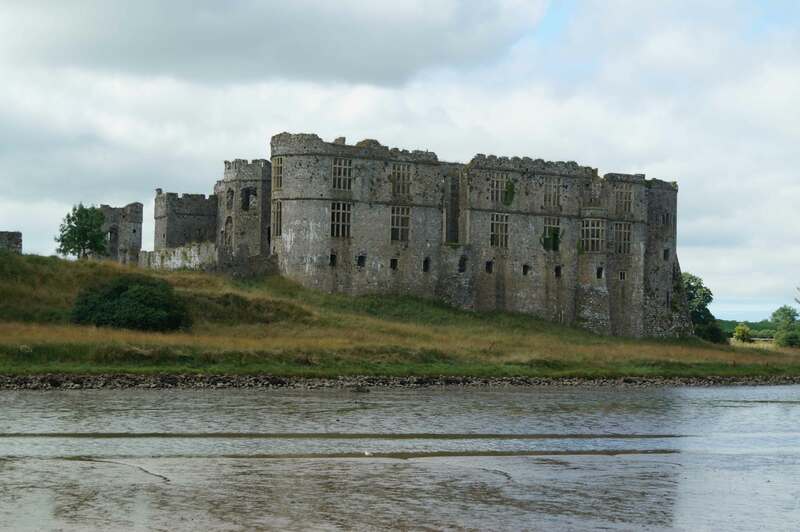 Situated at a crossing point over the adjacent river, Carew Castle was built by an ambitious Norman seeking to acquire territory and wealth from the Norman conquest of South Wales. Later the castle passed through several owners, including Rhys ap Thomas, but suffered extensive damage during the Civil War. 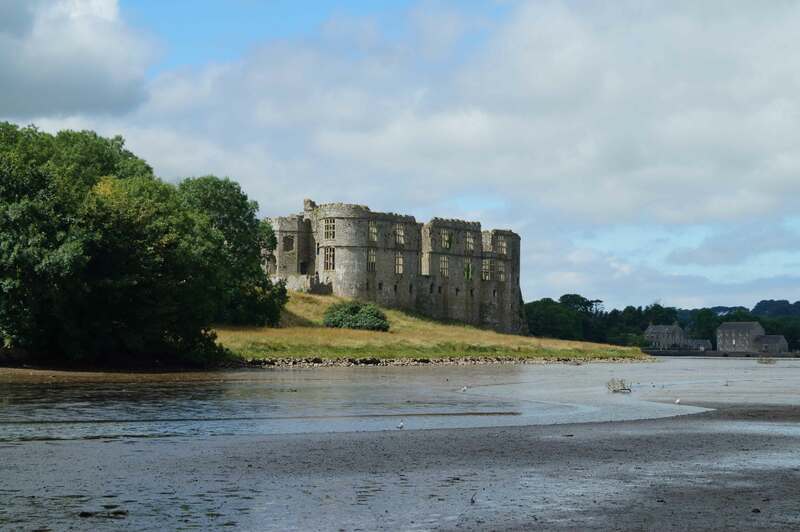 Carew Castle is located on the shores of the River Carew near a fording point but was also in vicinity of a deeper channel that made the site accessible to large sea-going vessels. For this reason the location may well have been occupied for thousands of years with some evidence pointing to an Iron Age Fort whilst archaeology has also indicted a Roman presence. Later the site served as the Royal capital of the Kingdom of Deheubarth with the Carew Cross, found in the immediate vicinity of the castle, possibly indicating the burial of Maredudd ap Edwin, King of Deheubarth in 1035. Certainly the land was owned by his family by 1100 as Carew formed part of the dowry of his grand-daughter, Princess Nest, when she married the Norman Lord Gerald de Windsor. Gerald de Windsor was a Norman who was the son of the constable of Windsor Castle. He was appointed as Steward to Arnulf de Montgomery who had led the Norman conquest of South West Wales from 1093. Arnulf appointed Gerald as Governor of Pembroke Castle which was his key fortification in the region. 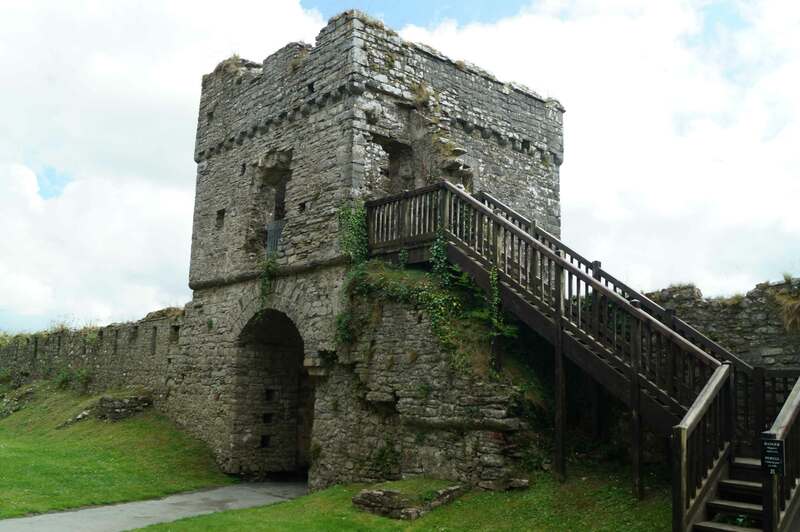 Surviving the downfall of Arnulf in 1100, Gerald built Carew Castle and, given the connection with the former Kings of Deheubarth, the construction on this historic site would have sent a powerful message to the local populace. The initial construction was a single stone, three storey tower acting as Gatehouse and Keep with a wider enclosure protected by a timber palisade. When Gerald died in 1176, his heirs adopted the name 'de Carew' and commenced a major rebuilding of the castle. In particular the Gatehouse was incorporated into a stone curtain wall that enclosed the Inner Ward. In the 1270s friction with the native populace erupted into the Wars of Welsh Independence with Llywelyn ap Gruffudd, Prince of Wales seeking to expel the Normans. Grufford's power base was in Snowdonia and the campaign of Edward I was focused in central and northern Wales. At this time the then owner of the site, Sir Nicholas de Carew, was a veteran of Edward's continental campaigns and used this experience to significantly enhance the castle’s defences. The Outer Ward was enclosed with a stone wall and a new Gatehouse whilst substantial towers were added to the Inner Ward. Throughout the fourteenth and early fifteenth centuries, the Carew family remained important magnates and notably raised Companies of Longbowmen who fought during many of the Royal campaigns in the Hundred Years War including at the English victories at Crecy and Agincourt. However, by 1480 the Carew family had fallen on hard times and the castle was mortgaged to Rhys ap Thomas. Rhys was a prominent Welshman who had inherited his family’s estates in 1470. During this time England was experiencing the power struggle between the Lancaster and York dynasties - the Wars of the Roses - and Rhys astutely support the Yorkist cause who were the ascendant force at the time. Serving first Edward IV and then Richard III, he built an extensive power base in South Wales. Despite promising to secure Wales to prevent support for Henry Tudor, Rhys changed sides to the Lancastrians in 1485. He provided cavalry to augment Henry's invading forces in August of that year which proved invaluable at the Battle of Bosworth Field (1485). This support to the fledgling Tudor dynasty served him well for Rhys was knighted on the battlefield and rose to become the most senior Crown official in Wales. He oversaw significant changes as Henry VII, having come from Wales himself and who had relied so extensively on their support to seize power, dismantled the power of the Marcher Lords who had exercised overlordship ever since the Norman invasion. From this point onwards the Welsh were equal in law to the English. The effect on Carew was conversion into a comfortable residence. Rhys added the ornamental windows that are seen today and refitted the internal structures for luxury living rather than defence. The surviving Gatehouse was also built at this time in a mock-Medieval style. Carew Castle became his primary residence. The heirs of Rhys ap Thomas fell out of favour with Henry VIII and Carew Castle was taken into Crown ownership. Eventually it was granted to Sir John Perrot who added a splendid Elizabethan North Range around 1558. The castle once again reverted to the Crown in 1591 and passed through numerous owners before finally being purchased by Sir John Carew in 1607. During the seventeenth century Civil War, South Wales was predominantly Royalist although, due to the ability to resupply via sea, Parliament had a significant garrison at nearby Pembroke Castle. Carew was garrisoned by the Royalists and became a frontier against sorties from Pembroke. Parliamentary forces under Colonel Laugharne seized the castle in 1644 but, faced with the approach of a Royalist army, he withdrew back to Pembroke. A second attack was mounted in the Summer and, after a one month siege, Carew Castle surrendered on 13 September 1644. On its capture the castle was partially destroyed to prevent any further military use and was confiscated by the State. It was restored to the Carew family in 1660 when Charles II returned to Britain but by this time it was in ruins and was never repaired. The Outer Ward disappeared over time with stone being robbed to support new buildings. Although still owned by the Carew family it was leased to Pembrokeshire Coast National Park in 1983. Pettifer, A (2000). Welsh Castles, A Guide by Counties. Boydell Press. Renn, D.F (1973). Norman Castles of Britain. John Baker Publishing, London. Carew Castle consists of the ruins of a Norman fortification that was regularly updated between the eleventh and seventeenth centuries. 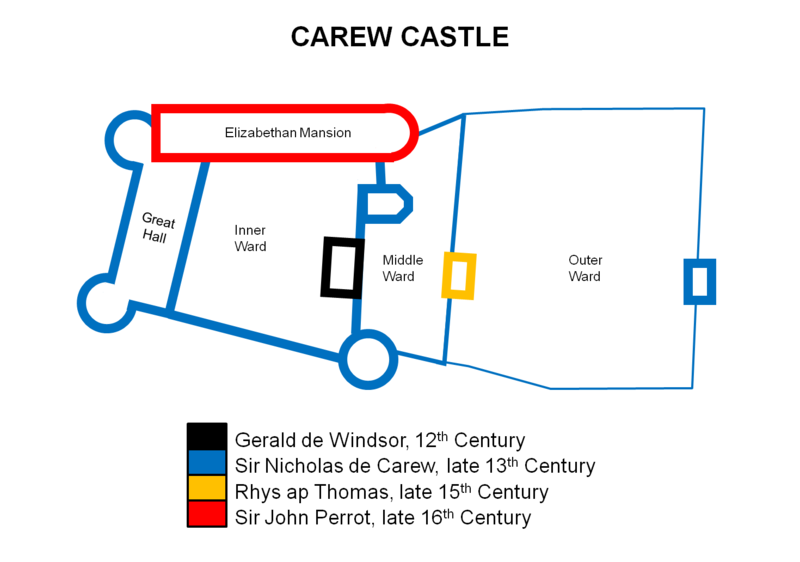 Carew Castle Layout. The only component originally of stone was the central tower with the bulk of the substantive defences being added by Sir Nicholas Carew. 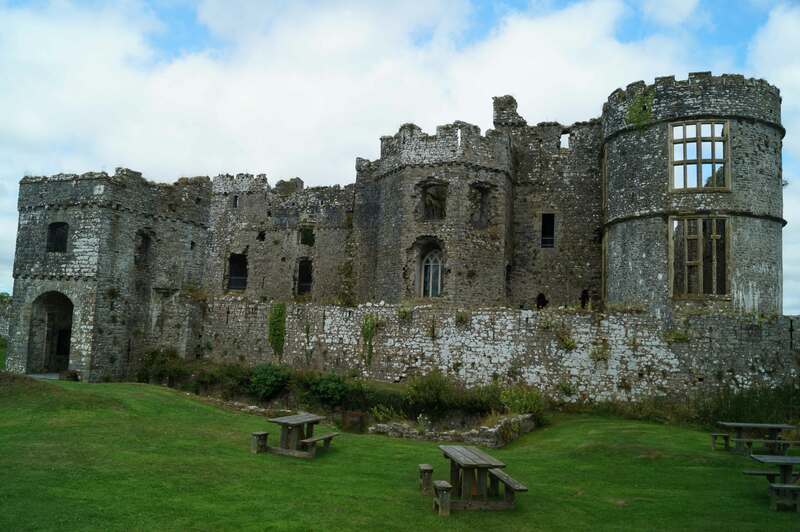 Rhys ap Thomas and, most significantly, Sir John Perrot, made changes to convert the castle into a Palace. Tudor Tower. The gatehouse, which was built in a mock medieval style, was built between 1480 and 1507. It replaced an earlier thirteenth or fourteenth century structure. Elizabethan Mansion. Sir John Perrot’s fine Elizabethan mansion can be best appreciated on the other side of the Carew River. Carew Castle. The name Carew derives from the Welsh word Caer meaning Fort and is believed to originate from either prehistoric or Roman times. Carew Castle is easy to find off the A4075 and the site is sign-posted from the A477 (the main route to/from Pembroke). Car parking is available in immediately vicinity of the castle. Entry includes access to the Tidal Mill across the River Carew.